If you hadn’t noticed, I haven’t been my crafty self this week. I have all these big plans for crafts, but every day something has got in the way. Don’t you hate it when that happens? I’ve been feeling so disorganized lately, and truth be told, I AM DISORGANIZED! Seriously, not only would I die from embarrassment if I showed you my craft supply closet and how disastrous it is, but I’m certain you would faint from the site of it. And PLEASE, whatever you do, do not let my husband open that closet….He will be MORTIFIED!! hahaha! I am behind on the laundry, the dishes are never done, and I am LONG overdue for vacuuming this house of mine! I had big plans for doing this really cute acorn craft the other day and then I realized the acorns I was going to use had never been taken out of the Ziploc baggy since we brought them home with us from our trip to Grandma’s house a couple weeks ago and mold set it on them…Bummer! So I figured I could just improvise and figure out how to still do the craft…That was until I was completely side tracked yesterday from someone bashing in my driver’s side window at 4a.m. and stealing my GPS out of my car. I’m sure my neighbors were delighted at the sound of my car alarm that went off for knows how long before I finally woke up and realized it was my car making that sound. As if it wasn’t scary enough, my husband happened to be on graveyard shift and wasn’t home….No fun!! So after dealing with paying for a new window yesterday, having unsettling feelings about my family’s safety, getting the garage back in order so I could park in it (we have had an unfinished project taking up too much space in there), and maybe one or two swear words (hey, just being honest! It was only Dammit, nothing worse! 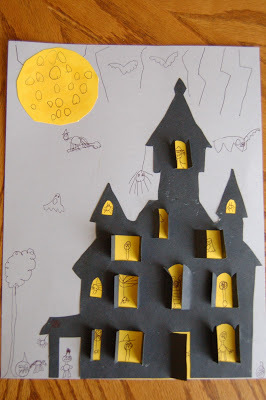 ), I decided the only thing that could possibly return some sunshine back in my life was staying up past bedtime making these adorable haunted house pictures I saw at Crafts and Things for Children which they found HERE. As I’ve already explained in the past, I am that crazy Mother who will slide on the bedtime rule (on weekends or when off track from school) in order to get some fun crafting in. Some may think I’m ridiculous but my kids sure seemed to think I was the coolest Mom in the Universe last night, so whatever! hahaha! 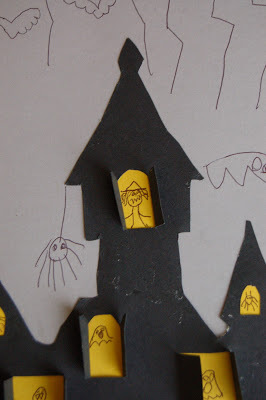 And they turned out so dang cute…You totally need to do this with your kids! And Andrew made sure to include at least one of every scary thing he could think of related to Halloween to make his picture just perfect (and to me, it is perfect!). 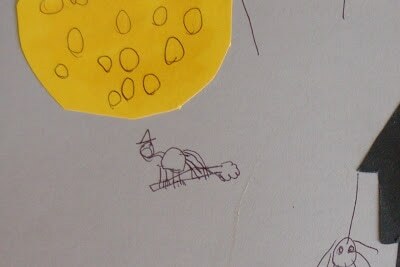 He even included lightning bolts in the sky. His witches are my favorite. 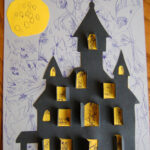 Here is the one in the window in the tallest tower and below is the one flying on her broomstick in front of the moon. So what have I learned after yesterday? What it boils down to, is that when you’re having a bad day the best medicine is to forget about yourself and how crappy you are feeling, and do something fun for your kids. It will surely bring a smile back to your face. very cute craft. We are totally doing this over the weekend. I had a crazy week too, but not like yours. Hope things settle down over the weekend, but my bet is they won't! I am pinning this one. You and I had the same kind of week, Rachel. I planned an activity with my son and when I went to pull it together, realized I was 7 can lids short. SEVEN!?! I guess I'll be doing that in two months. (sigh) Hang in there and don't worry about being disorganized. Sometimes it stesses me out, othertimes I just resolve to embrace the chaos. Your haunted houses are A-MAZ-ING!! Love them! Rough night. That's no fun at all. 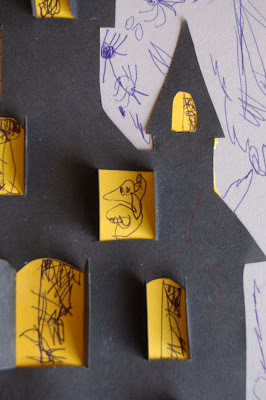 I'm glad some happy drawing with kids cheered you up some. 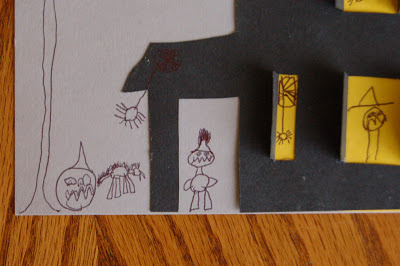 I love the spiders and goblins. I made one like this before but using a castle on top of a hill concept! soooo sorry about the stolen GPS scare. the same thing happened to us a few years ago, broken window and a stolen CD player. 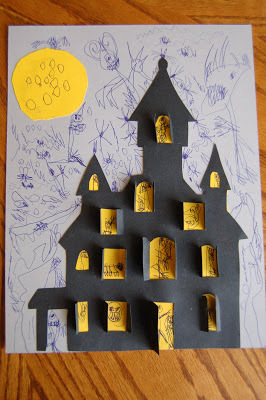 thanks for the cute haunted house idea. My boys will love it! 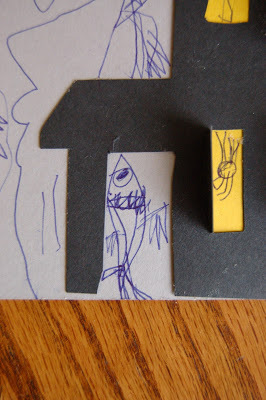 Thanks for linking up at Crafty Moms Share, Rachel! 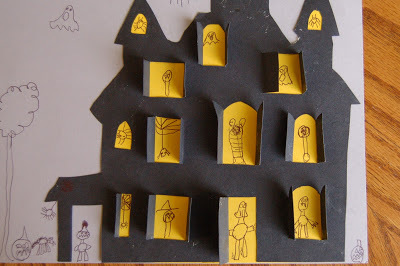 What an awesome haunted house! I wish i had discovered this before today – my big kids would have loved it! What a great project! I really like this. So cute! We may do it today even though Halloween is over. 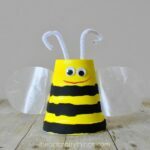 Thank you for this wonderful craft idea, did this last week with my after school art club, they loved it, going to do more.